You’ve heard about the slew of award-winning brands from Toronto-based DECIEM, including professional skincare brand NIOD and affordable yet effective The Ordinary. However, there’s a new kid on the block you may not know about just yet--we’re talking about hif haircare. The first hair-focused imprint to emerge under the DECIEM umbrella, hif takes everything we know about traditional haircare and flips it on its head. The result is scientific yet easy-to-use products that make taking care of your tresses a one-step process. hif stands for ‘Hair is Fabric’, and this is truly the main pillar behind the brand, as their professional-grade products see just how precious and full of potential your hair is. 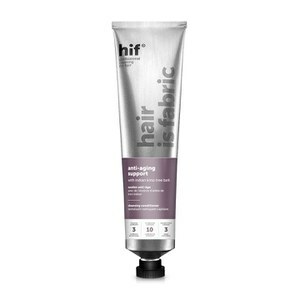 The hif range features one type of product, the Cleansing Conditioner. Within this, though, there are a wide variety of solutions designed to target hair types including thin, lacklustre, dry, frizzy and even mature. hif products work off a one-step philosophy that is designed to cut out the need for shampoos and hair treatments. Instead, the Cleansing Conditioner does it all, based on your unique haircare needs. Simply pop onto wet hair and massage in as usual, leaving in for around 3 minutes. 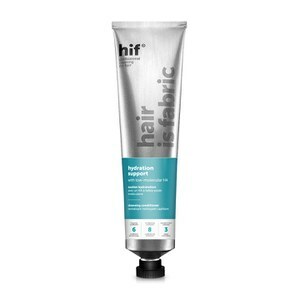 Rinse out and voila--that’s all it takes to achieve gorgeous hair with hif. If your hair needs a boost of moisture, try out the Hydration Support Conditioner. Formulated using low-molecular HAs, not only will this product nourish and hydrate your hair, it will ensure water stays within the hair shaft, locking in moisture. For the mature ladies and lads out there, hif has created one of the first anti-ageing hair products on the market. The hif Anti-Ageing Support Conditioner improves strength, elasticity and texture, as well as protecting against environmental factors including free radical damage. These are just a few of the ultra-effective ‘hair support’ products within the range--there’s a formula perfect for every hair type and concern with hif. Shop hif by DECIEM today with Facial Co, your authorised Australian stockist. Free shipping on all Australian orders over $99, plus Afterpay now available!